TsukuBlog | Celebrating Soba again this year! 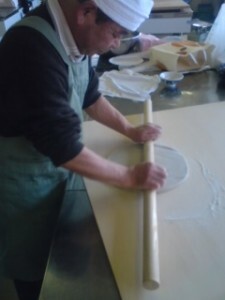 Making Noodles, Dumplings and Cakes- all out of Ibaraki`s famed buckwheat! 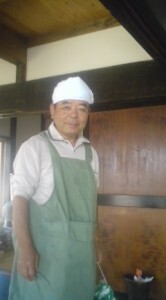 Mr. Shiina, at my place, ready to make soba-from scratch! I had heard it said, more than once, that in Japan, THE BEST soba (buckwheat) noodles were to be had NOT at famous restaurants, but at the homes ( or at the hands) of experienced, soba-loving AMATEUR noodle-makers. 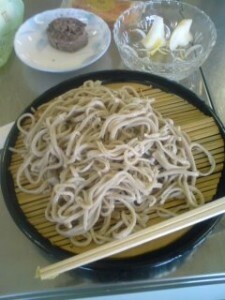 This is good news for those of us who live in Tsukuba City, since our Prefecture, Ibaraki, is SOBA COUNTRY, where a delicious variety of buckwheat ( Hitachi no Aki Soba) is abundantly produced, and where it is very common for THE MEN of the family (soba making requires a lot of muscle!) 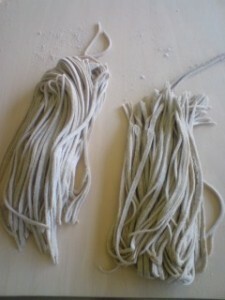 to be skilled soba noodle makers, who love to share the fruits of their labor with neighbors and friends. Though I knew at that moment that I was going to have a great soba experience, I could not imagine what was actually in store. Not only the best buckwheat noodles Ive ever had, made from freshly milled flour, but the additional treat of soba prepared in the MUCH more ancient way- as dumplings ( soba-gaki), and also in a novel form- as a tasty cake made of soba flour and sweet azuki beans ( anko). Even the dipping sauce for the noodles was home-made, and all the vegetables from the participants gardens. In Japan, people take their hobbies seriously and as a rule prepare all the besｔ equipment they will need even before they get underway in their lessons. This often involves great expense. That is why you will more often than not find Japanese skiiers, scuba-divers, fishermen, bird-watchers etc., enthusiasts in any activity really, decked out in the best appropriate wear and with the best equipment and gear. 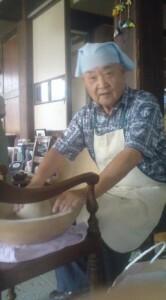 That is why I was not surprised to find that Mr. Shiina, and the other soba makers who gathered at the Oho Community Center`s kitchen, had brought with them an array of special tools, and proceeded to wrap towels around their brows giving them that authentic soba-maker look. 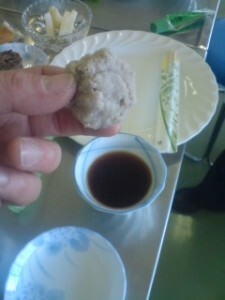 Mr. Shiina showed the same focus and intensity, as he little by little, slowly slowly, blended the buckwheat flour and wheat flour ( we were having NI HACHI SOBA- which literally means 2-8 soba. 20 percent wheat flour and 80 percent buckwheat). 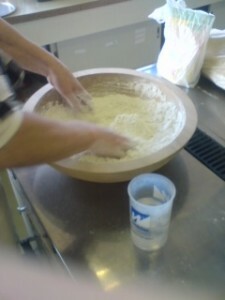 He continued in the same way to blend in the water, even so slowly and carefully, to form the dough ( the water would end up comprising about 40 percent this). Kneading a large ball required plenty of effort and it was at this time that I realized why the towel was so important- to keep the sweat from dripping into the bowl! 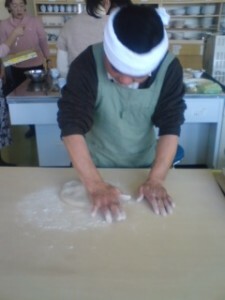 When he was satisfied with the condition of the dough, Shiina-San started to roll it out . 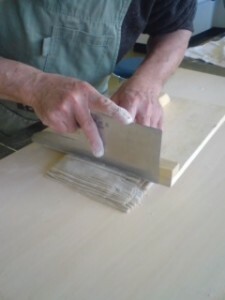 When the proper thinness was achieved, slicing was begun. It was then we got the pots boiling. 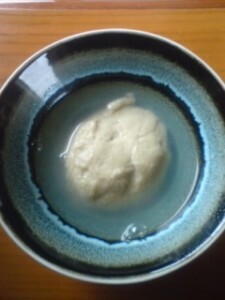 After dumping a lump of soba ( one servinging) into the bubbling water, it was boiled for 20 seconds after it rose up to the top. 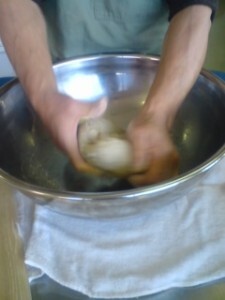 At the same time we started to make soba-gaki ( buckwheat dumplings). This was extremely simple, great fun and rewarding to the tastebuds. 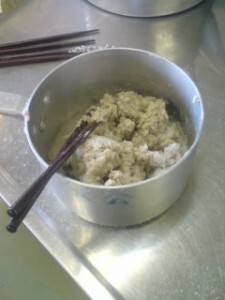 We merely had to mix in hot water, again little by little, into a pot of plain buckwheat flour and stirred. We did this till we got the right consistency. To eat we just spooned out the paste and molded out dumplings with our hands. we dipped this in soy sauce and wasabi. Rustically delicious! 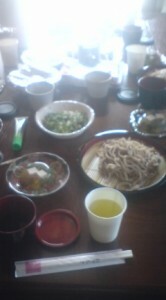 As I have already, said the resulting meal included the BEST soba I had ever had- BY FAR! Not only because of the fresh ingredients and skillful preparation. Not only because our appetities had grown strong after all the hard work and long wait before eating. What made it so very extra special was something which is another key characteristic of Japanese culture and life in Japan in general- everyone loves FOOD, and EATING is always a joyous occassion, especially when everyone helps out in the preparation. It was truly a SOBA CELEBRATION! Add water and soy sauce and continue boiling for another 1-2 minutes. This keeps in the fridge for up to ten days. You can also freeze it and defrost it whenever needed. This year`s soba feast, held at my place featured Mizutani-San amazing gelatine dish featuring a collection of tasty seasonal edibles- myoga, shiso, etc..
Mt. Tsukuba`s Wild-Boar Population Increasing – and so do their forays down to the farms and garden on the plain below!